Today in Masonic History Christopher Michael Wren passes away in 1723. 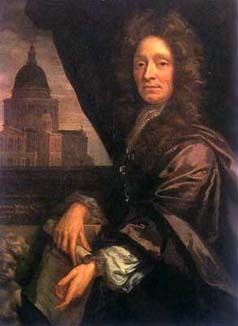 Christopher Michael Wren was a British architect. Wren was born in East Knoyle, Wiltshire, England on October 20th, 1632. The only surviving son of his parents, it was believed that he was sickly. The term at the time was consumptive which generally referred to pulmonary tuberculosis. His father was the Dean of Windsor and the family traveled between Knoyle and Windsor, although little is known of Wren's life in Windsor. For the first eight years of his life he was educated by a local clergyman. After the age of eight little is known about his education except was is written by his son in Parentalia, or, Memoirs of the family of the Wrens which was written by Wren's son. The known record of his education picks back up in 1650 when he attended Oxford University. He graduated from Oxford with Bachelor of Arts in 1651 and a Master of Arts in 1653. Information, which cannot be dated, states that Wren used his artistic skills to make extensive anatomical drawings of the brain. Some of those drawings would be used in 1664 in a text book that would be the first to use the term neurology. In 1657, Wren became the Professor of Astronomy at Gresham College. At the college one of his duties was to provide free lectures to the public, both in Latin and English. It was from these lectures that in 1660 the beginnings of the Royal Society of London was formed. The Royal Society was officially chartered in 1662 by proclamation of King Charles II. In 1665, Wren was brought in to redesigning the battered St. Paul's Cathedral. That same year he made a trip to Paris to study the architecture. Upon returning from Paris he made his first drawings for the redesign. Unfortunately a week later the Great Fire of London occurred. Two thirds of the the city was destroyed. Wren approached Charles II offering to help design the new city. The King never adopted Wren's plans, although in 1669 he made Wren the King's Surveyor of Works. This meant that although Wren would not be designing the rebuilt London, he would have an influence on it. Wren personally helped redesign 51 churches after the fire. Wren passed away at the age of 90 on February 25th, 1723. He often went to St. Paul's to check on the progress of his "Greatest Work" when, one day, he caught a chill and passed away the next day. It is reasonably well documented that Wren was a member of Antiquity Lodge No. 2 in London. Antiquity Lodge, which was an operative lodge at the time, was one of the founding lodges of the Premier Grand Lodge of England. Wren was "adopted" into Antiquity Lodge No. 2 in 1691. Adopted was a term used by operative lodges in reference to honorary members of the lodge. It was not until after Wren's passing that the more popular speculative lodges began forming around London. It is more than likely that the workman at St. Paul's Cathedral, who were members of the operative lodge, invited the "Boss" and patron to be an honorary member of the fraternity. The records of Antiquity Lodge No. 2 were lost in a fire so there are no written records of Wren's membership, real or honorary.